Geneva, 2 January 2017 – If you are crossing today a customs check point at the airport or an international port be aware that new trade regulations for over 500 species of animals and plants are just entering into force. They were adopted 90 days ago in Johannesburg, South Africa at the 17th meeting of the Conference of the Parties to CITES (CoP17). As the New Year starts, the 183 Parties to CITES (182 countries plus the European Union) - the international treaty that regulates global trade in wildlife - will harmoniously apply these controls to their citizens and businesses with the aim of protecting our irreplaceable wild fauna and flora. CITES Secretary-General, John E. Scanlon said “CITES CoP17 was a game changer for the world’s wildlife, with international trade in 500 more species brought under CITES controls, including high value marine and timber species. CITES also adopted a vast array of bold and powerful decisions addressing critical areas of work, such as curbing corruption and cyber-crime, and developing well-targeted strategies to reduce demand for illegal wildlife. These far-reaching outcomes of CoP17 will impact on wildlife and ecosystems, as well as on people and economies. We are all now focused on the implementation of these decisions for which we need equally bold concrete actions. The amended list of protected species, called Appendices, is legally binding and will now be built into the national laws and practices of governments around the world to give them the required legal force. In the meantime, the nearly 400 resolutions and decisions adopted at CoP17, a number of which have ground-breaking potential, are to be implemented on the front line from today. CITES Parties adopted 51 proposals to change the listing status of over 500 species of wild animals and plants under CITES Appendices, 39 resolutions (revised or new) and 351 decisions. 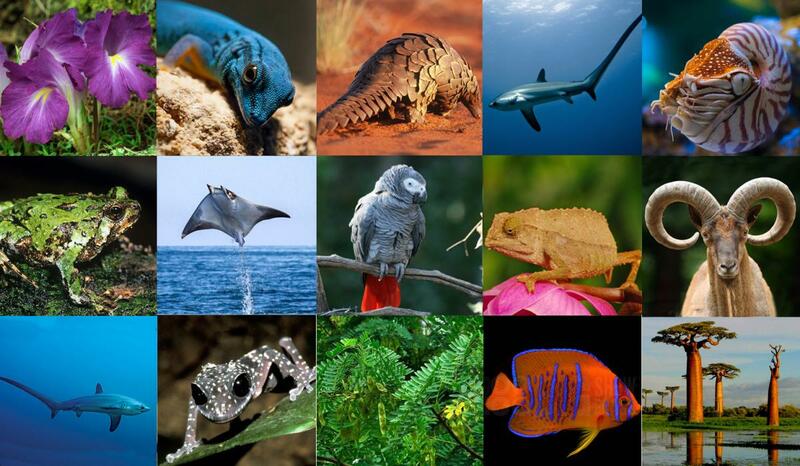 Ensuring legal, sustainable and traceable trade in CITES-listed species is essential for their long-term conservation. Continuing a trend from the previous CoP, Parties at CoP17 resorted to CITES for a higher level protection of additional marine species of high commercial value, most notably through the inclusion of the silky shark, all thresher sharks and all devil rays in CITES Appendix II. This will mean that future trade in these species can only happen subject to science-backed evidence that the trade will not be detrimental to the survival of the species in the wild. The entry into force of the new listings will be delayed for 12 months for the shark species and 6 months for the devil rays, namely to 4 October 2017 and 4 April 2017 respectively. The success of CITES in supporting legal, sustainable timber trade and addressing illegal trade saw a further 300+ timber species, i.e. all Dalbergia rosewood and palisander species found across the world, being brought under CITES trade controls at CITES CoP17. Legal international trade in timber is worth hundreds of billions of dollars every year. Thanks to CITES trade regulations, CITES Management Authorities establish the veracity of the legal origins of rosewood and palisander species before they enter international trade, and CITES Scientific Authorities advise on the sustainable nature of the harvest and exports. Customs officials at border crossings across the globe will verify CITES permits for all such international shipments. CITES CoP17 put pangolins, the previously almost unknown ant-eating species found in Africa and Asia, under the international spotlight. They are now widely recognized as one of the most poached and trafficked mammals in the world. The world’s governments decided at CoP17 to offer pangolins the highest level of protection under CITES through an Appendix I listing which prohibits all commercial international trade of wild taken specimens. The Appendix-I listing will also serve as incentive for the world’s governments to step up law enforcement and demand reduction efforts to better protect the species. Some lesser known but equally important species are brought under CITES trade regulations from today. These include the nautilus, the Grandidier’s baobab tree, and many amphibians and reptiles, such as alligator lizards, the psychedelic rock gecko, the Chinese crocodile lizard, the Titicaca water frog, and the tomato frog – species often seen in the pet trade, and that need controls to ensure sustainability and legality. In recognition of their improved conservation status, the Cape mountain zebra, several species of crocodiles and the wood bison are now downlisted from Appendix I under CITES to Appendix II, which allows commercial trade to take place. This is a recognition of the success in the protection and restoration of these species. A species is moved to a lower level of protection when Parties are satisfied by the scientific analysis that the population of the species is healthy and regulated trade will not be detrimental to their survival in the wild. That is why the downlisting of a species in CITES is seen as a conservation success. The Convention allows any Party to enter a reservation with respect to the amendment to the Appendices within 90 days. Any Party that entered such a reservation would then “be treated as a State not a Party” to the Convention with respect to trade in specimens of the species concerned. The deadline for entering reservations on the new listings adopted at CoP17 ended today. Although the full picture is not yet clear, India has entered a reservations concerning the inclusion of all rosewood and palisanders (Dalbergia spp.) in Appendix II and Indonesia has done the same, but only until 4 July 2017. The Democratic Republic of the Congo has entered a reservation concerning the inclusion of the African grey parrot (Psittacus erithacus) in Appendix I. Japan has entered reservations concerning the inclusion of the silky shark (Carcharhinus falciformis) and thresher sharks (Alopias spp.). Improved and new compliance mechanisms represent another major success of CoP17 in support of sustainability (renewed Review of Significant Trade process), legality (new National Ivory Action Plans and advancing the National Legislation Project) and traceability (verification of captive bred and ranched animals in trade).